Sakai Guides and DocumentationSakai Complete User Guide LessonsHow do I require completion of a Lessons item? Most of the items that can be added to a Lessons page can be made "required". That is, students must open (if the item is a resource) or complete (if the item is a forum posting, quiz, assignment, question, comment or student page). Further, the Lessons tool allows instructors to require students to complete one item in the list before allowing access to another item in the list. 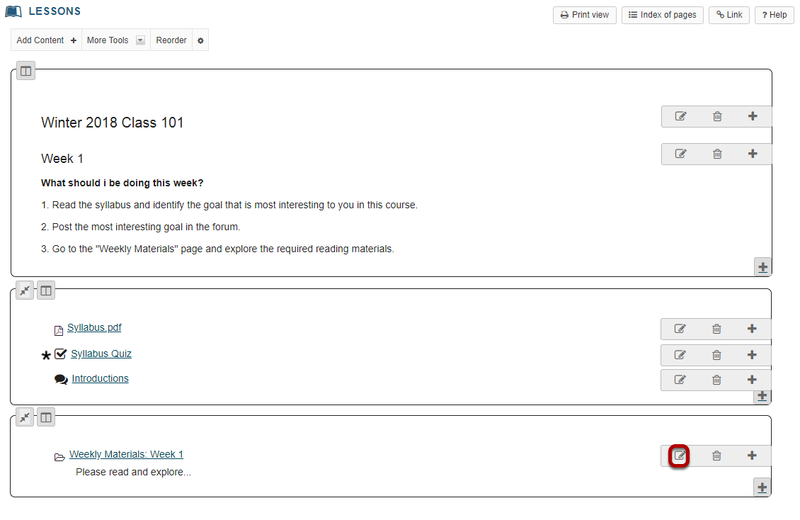 Click on the Lessons page title in the Tool Menu to display the page. Click Edit for item that will be required. Zoom: Click Edit for item that will be required. 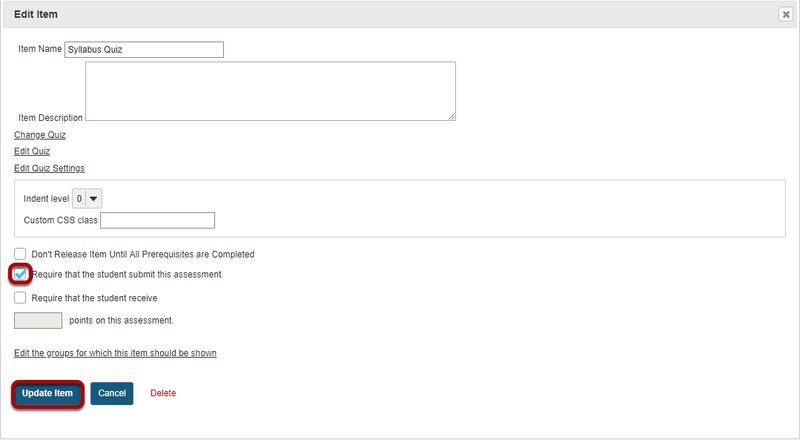 Check Require that the student submit this assessment, then click Update Item. Zoom: Check Require This Item, then click Update Item. Notice that Required items are indicated with an asterisk to the left of the item. Click Edit for the item to be restricted. Zoom: Click Edit for the item to be restricted. Zoom: Specify completion of prerequisites. Check Don't Release Item Until All Prerequisites are Completed option, then click Update Item. Notice that items that are conditionally released display [Has prerequisites] in red text next to the item. 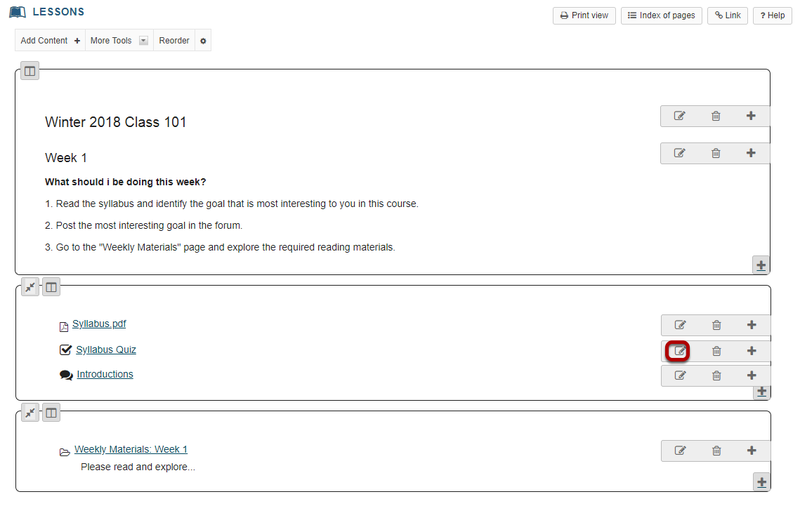 In the example shown above, the Weekly Materials: Week 1 cannot be opened until the required Syllabus Quiz has been submitted. Prev: How do I view the Index of Pages? 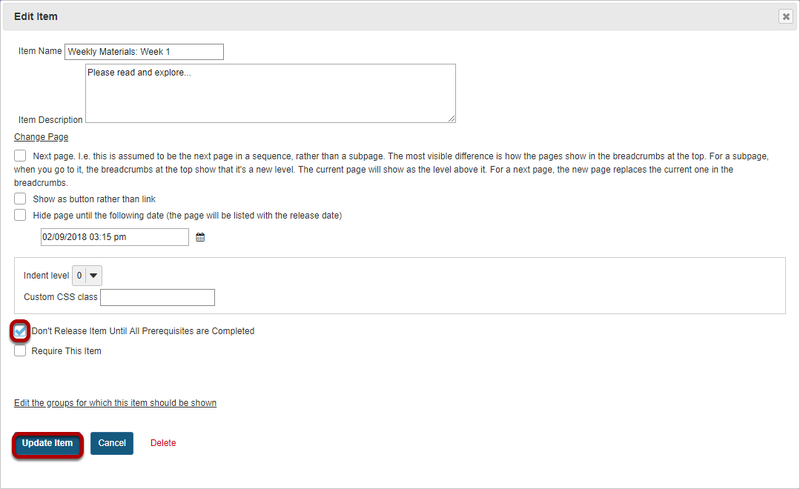 Next: How do I require completion of a Lessons page?